Deuce To Seven Triple Draw is a version of draw poker which uses lowball hand rankings in which hand strengths are essentially inverted. Deuce To Seven is also known as 2-7 for simplicity. There are several lowball poker variants which are similar – California and Kansas City lowball for example – but differentiated by small differences in hand rankings. This is draw poker which means at some point players get the chance to discard and replace cards; the aim is to create the strongest five card hand at the showdown. 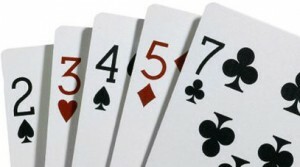 Aces are high and straights/flushes count against you, meaning that the strongest possible hand is 2, 3, 4, 5, 7. Blinds are used with the players to the left of the dealer betting the small and big blinds respectively and then each player is dealt five cards face down. Players remaining in the game can now draw, meaning that they can discard and replace any or all of the cards to try and make a stronger hand. Two more betting rounds and two more draws (that’s the Triple Draw) follow and assuming that two or more players remain in the hand, a final round of betting follows, followed by the showdown. Hands are now compared according to the specific Deuce To Seven rankings which you can see by clicking on the Hand Rankings link at the top of the page. The strongest possible hand is 2, 3, 4, 5, 7, assuming it’s not a flush. It’s possible to tie hands in which case the pot will be split. Discarded cards will usually be set to one side but if they are required due to the number of draws, they will be added back into the deck which will be reshuffled.